Currently this work is being led by ERSAM Lab grad students Ryan Nagelkirk and Gloria Desanker (co-advised with Andy Finley). Coarse grain (meaning bigger than a single plant canopy, in this context) seasonal changes in vegetation leaf area is called 'land surface phenology'. These seasonal changes are important because their timing and magnitude influence the carbon cycle, energy balance, surface roughness, biogeochemical cycling, and more. 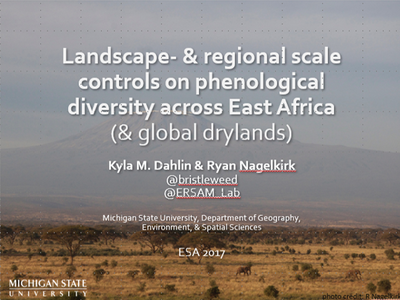 We are particularly interested in semi-arid and savanna-type (SAST) land surface phenology, which is additionally challenging because in many parts of the world there is no really cold season to 're-set' plant growth. In addition, in some regions (especially eastern and southern Africa) there are often two rainy seasons per year, meaning two green seasons per year, which goes against a lot of the assumptions that go in to many phenology models. We have been looking at SAST phenology from a number of different angles, including Earth system models, meta-analysis, correlations with climate teleconnection patterns (see figure), and more recently work looking at abiotic factors' influence on fine grain phenoregion patterns (Desanker et al in prep). There are many satellite remote sensing products (e.g. soil moisture, LiDAR & radar, fine spatial & temporal resolution small sats) that could contribute to this research, which we hope to use in future projects. As vegetation-focused ecogeographers we often assume that plant distributions are primarily controlled by abiotic factors (climate, topography, geology and soils) yet in many parts of the world, herbivores, large and small, play an important role in vegetation patterns and processes. Because they knock down trees, African savanna elephants potentially have a major influence on landscapes, possibly big enough to see from space. And potentially big enough to effect the Earth system via changes in albedo and the carbon and water cycles. 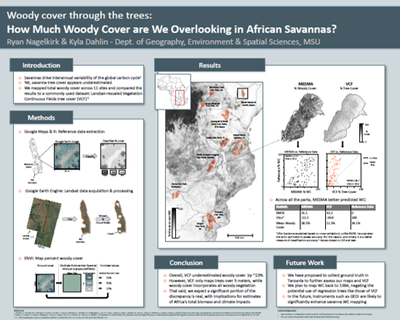 But to assess this we need to be able to confidently map woody plant cover in savannas and how that changes over time, which is no small challenge (Nagelkirk et al in prep). 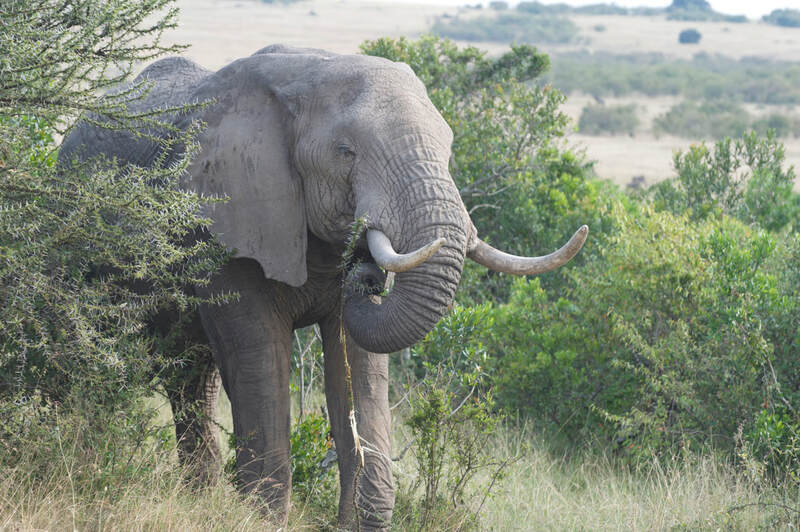 A megaherbivore (African savanna elephant - Loxodonta africana) having an impact on woody vegetation in Amboseli National Park, Kenya. Photo credit: Ryan Nagelkirk.